Danny is brother to Duffy and Kaydee. QuickSilver’s Clear Blu, whose call name is Danny, is a wonderful addition to the McGuire household. 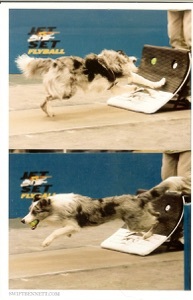 Danny came from 2 great Flyball dogs - Quicksilver’s Shiner and Hollowshot Trippin' On Sunshine. And he has certainly proven that he is a Flyball Star! 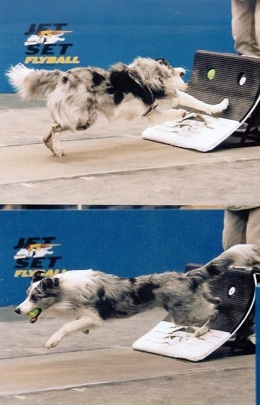 He started training for Flyball as soon as he was born. As soon as his eyes were open, he was playing with tugs and balls. He couldn’t of had a better start in life than that. Danny is a joy to own. He loves to play but when it’s time to settle down and be a couch potato, he will do so willingly. Danny was a very quick learner and developed an amazing swimmer’s turn that makes him easy to pass. He earned his FD in June of 2007 on his first full run. Since then, he has won the Oriole Dog Training Club’s Sidekick Award for being a great dog to be on the team with. Danny is very easy to run. So much so, that Branden (No Speed Limit’s youngest member) was able to start running him at tourneys at the age of 7. They are now a regular pair at all the local tourneys. Branden handled Danny when he achieved his fastest time to date – 3.73. Danny is working to be as great a Flyball dog as Duffy. 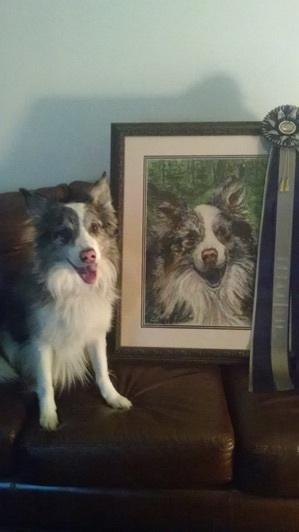 He has been in NAFA’s top 40 Pointed Dogs each racing year since 2008. Danny's is a HOBBES Dog and Iron Dog! He achieved both awards on 4 October 2015. Since he is only 9, he will be helping the next generation to earn their titles.